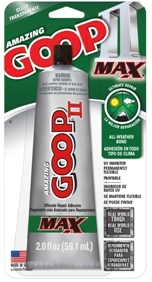 AMAZING GOOP Adhesives are here to help you in the home and on the job. They are designed to adhere to virtually any surface with exceptional strength, to meet your bonding, sealing and repairing needs. What makes AMAZING GOOP amazing? To start, you can glue just about anything. Here are just a few of the ways that AMAZING GOOP can help your projects, large and small.